technology | JazzRoc versus "Chemtrails"
“Who gave these people permission” – Nobody has. “we are experimenting on a global scale” – “Nobody” IS. EVERYBODY IS. “This (seeding the central oceans with phytoplankton fertilizer) is a BAD idea” – It’s the BEST IDEA IN YEARS. “You say that CT’s are disinformation” – WHAT is MORE disinformative than NON-EXISTENCE? “global warming is the reason” – We’re heading for an ICE AGE! (Or we were, before we burnt 300,000,000 years worth of fossil fuel in 200 years). “You apparently did work for the government/making your motives questionable” – What do you know of my motives? If I tell you I had a further sixty jobs, does that make a difference? If you question my motives, should I care? “Global Warming IS DISINFORMATION” – It possibly is; no-one has an equation which everyone can agree on. I take a Gaian point of view: the Living Earth will balance ALL unbalancing forces and/or finally ELIMINATE the unbalancing force. If that’s you, then more the fool you are. “its a lie, to cover up the real motives at work here” – All men are liars. So are YOU if you pontificate… And as I know quite personally what I think, and also that you don’t know what I think, please allow me to call you a LIAR. “EVERY SINGLE PLANET is WARMING UP” – True, but many of those planets are DEAD. LIVING PLANETS CAN QUITE EASILY COOL WHEN THEY ARE WARMED BY THE SUN – BY ALTERING THEIR ALBEDO. “The real reason is OIL” – There IS no “reason”, remember? “The government/dedicated/oil industry” – You are SUCH a fool. You obviously believe in gov’t conspiracies etc. But HOW did YOU keep WARM this winter? Burnt some CARBON, DID YOU? “They are not interested in CO2 reduction” – Funnily enough, that doesn’t seem to be true (either), partially because they believe their own propaganda. “They only want to treat the symptom not the cause” – The CAUSE is YOU. You, me and every other dumb clutz that MUST have a computer, keep warm, go to work, have children, “settle down”, celebrate Xmas, visit the relatives, read a book after sunset…. Hi piasillo. No, I’m an ex-engineer retired in Tenerife and composing music. Look me up. Lung and skin diseases are caused by pollens+auto fumes+photoreactive smog, and can kill the young and old. 1500 active volcanoes (24/7) make Man’s efforts puny by comparison. Living plants have been turning THIS into FRESH AIR for 3 billion years. Worry about auto fumes, photoreactive smog, deforestation, and loss of ocean phytoplankton. Be reasonable. “in movies up until the 90’s” – You mean, before CHEAP and PLENTIFUL air travel. “When I was a kid/dissipate” – NOT TRUE. When you were a kid, you weren’t making the (false) connections you are making today. 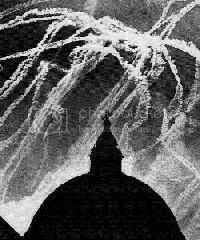 In 1943 the US Flying Fortresses were being shot doen in their HUNDREDS as a consequence of PERSISTENT CONTRAILS! “Today they stay” – THOUSANDS of large aircraft are ADDING WATER TO THE STRATOSPHERE. You MIGHT EXPECT the INCREASE in saturation of the stratosphere to produce an INCREASE in the persistence of contrails. Problems are going to confront our species from time to time. It is said (by those best qualified to understand the problem) that it was already too late to prevent Global Warming in the seventies, when at that time those best qualified to understand were predicting the onset of the next Ice Age. Ah, well! Kyoto and its “cap and trade” carbon agreements are threatening to become as much of a disaster as the events it is intended to obviate. This is possibly because there are other activities which may be carried out which may also be used to prevent disaster, which presently have a very low priority. b) to adopt measures which work in the opposite way to global warming, like seeding the sky with droplet nucleii and causing more clouds, thus raising the albedo of the Earth and cooling it, or fertilize the mid-oceans, causing phytoplankton to absorb more CO2. This is a collection of books related to the Pseudoscience category in The Millenium Project. All commissions from sales in the Health Fraud, Vaccination and Pseudoscience categories are donated to the Australian Council Against Health Fraud to help in the fight against quackery. “finally admit to the spraying of aerosols” – I’m a retired engineer living in Tenerife. I have NO money, and NO income either. Aerosols exist in the air, naturally, from volcanoes and animals and plants. They have been found as high in the atmosphere as any plane has flown. There are NO signs on planes or airfields of unusual (and corrosive!) fluids. Such fluids would make the plane DANGEROUS. Eventually, if not immediately, it would CRASH. “all u do is debunk the word chemtrail, nothing else” – I’m hurt. On my channel there were 13 musical works. My Favourites were there for you to enjoy, as were my playlists. You could have found me, if you cared to look, on other science forums, discussing internal combustion engine design and arguing FOR Evolution on YT, and you’ll find other video sites, and many other music sites. There were a 1000 hits for me in Google (that’s now 7000, but I’ve amended the text to account from my YouTube ban, and other bans). “u will see the truth” – NO-ONE has seen THAT! Certainly not you, you dumb clutz. “random videos in your channel 2 make it look as though your an average guy” – Gee – thanks! Learn to spell. Then f*** off. “You have just started doing that as people became suspicious” – Er, NO. If you look up myspace.com/jazzroc you’ll find out MUCH MORE about me, friends, pictures, wedding, classical music, blogs, etc. And check out SoundClick/Beachcomber, you’ll find more, and GarageBand/JazzRoc, and Esnips under Beachcomber/Jazzroc. All of this PRECEDES my YouTube account. 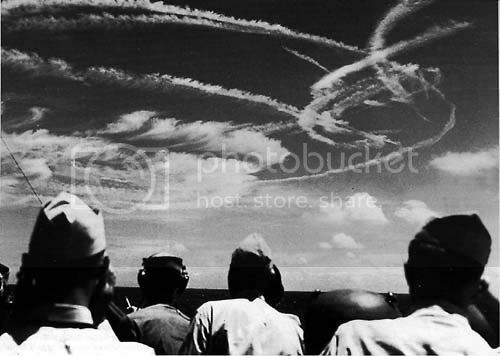 The reasoning (that contrails disperse quickly, and that which doesn’t is a chemtrail) is FALSE because SIXTY-FOUR YEARS AGO in WW2 US Flying Fortresses were hunted down by their persistent trails, which are always left in HUMID stratospheric (NB. : NOT tropospheric!) conditions. The reasoning that Xes and grid patterns signify something proves to be FALSE because it can be easily demonstrated that shuttle traffic and crossing routes create these, and no further significance need be inferred. To go beyond that is to seriously enter the land of Oz. The reasoning that we are being sprayed proves to be FALSE because the stratosphere (where it is said to occur) is TOO HIGH to target anything accurately, and passenger planes have no apparatus other than fuel dump nozzles to do it with. Engines would STERILIZE “morgellons”, and be PUT OUT by metal powders, so THAT idea is FALSE. The reasoning that “morgellons” is being used to depopulate the United States and the rest of the world, aside similar logistic objections (and 2000 deg exhaust temps), is FALSE because NO-ONE in peace-time (except maybe a child/moron!) is going to go out in the morning in protective clothing and spray his own people. What assurances would they have to accept before they did this? So now we’ve covered nearly everything, which TOTALLY CRAP idea would you like to RETURN to? “trails that start and stop for no reason” – FALSE. Stratospheric layers with differing temperatures and humidities. “linger indefinitely” – The layer is 100% humid. “grow into WILD feathery or crystalline shapes” – CIRRUS cloud. “Many were sprayed” – BASELESS LIE. “normal contrails” – A layer less than 100% humid. 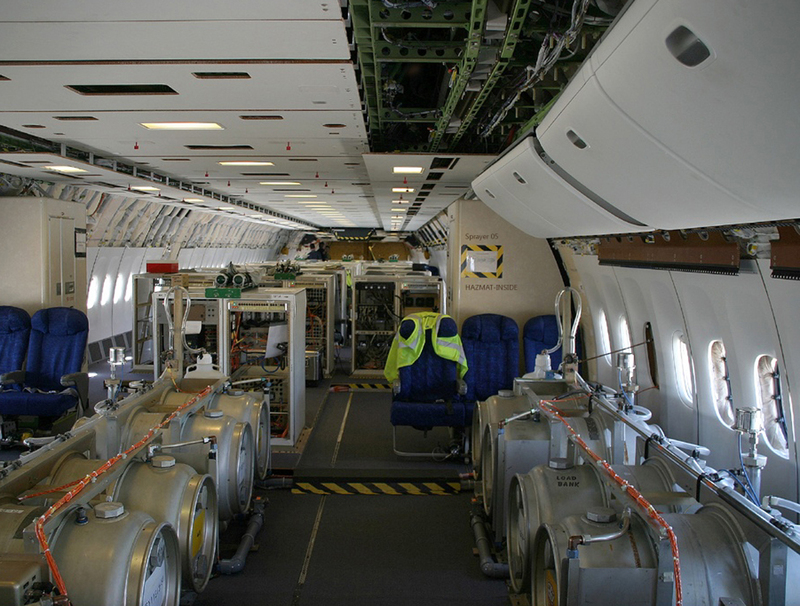 “RESEARCH CHEMTRAILS if you have questions” – And you’ll get LIES for an answer. It’s true. The States needs another political party. It should be called the RESTITUTION PARTY. When in power it should lock up the Bush Cabal and throw away the key, then take the USA out of Iraq, apologising as it leaves. It should then disarm its people and hand its useful arms to the UN, thereby paying its bill. It should then adopt a RENEWABLE FUEL policy, and compensate all the countries whose people it has murdered. But don’t think that I’m on YOUR side. I’ll NEVER side with a bunch of ignorant liars who don’t know which side is up when it comes to the nature and the DANGERS of contrails. The story’s been written – CHICKEN LITTLE! “the cockpit would be empty” – This technology has been employed by aircraft for FORTY YEARS. What sort of revelation is THAT? “I have a hard time believing our own people would do this to us” – Of ALL your hypocritical statements this is the best. “Maybe jazzroc is a pilot?” – I last wanted to be a fighter pilot when I was fifteen. Then I decided I’d rather NOT FLY into danger until it became absolutely necessary. Dating had something to do with it. “started criss crossing the skys” – Fast-moving and damp and yet TRANSPARENT stratosphere, crossing passenger shuttle routes are WETTING IT. Learn to spell. “donuts” – Their correct technical name is PENDULES. “quicker into clouds” – Because they ARE clouds, of FALLING ice crystals. Normally known as CIRRUS. “It doesn’t matter what you believe” – in the case of SCIENCE, NO it doesn’t! “darkness/decieve/fool/traitor/poison/nanobots/whatever” – Get that STAKE out and BURN ME. “don’t pay JazzRoc A.K.A. (Epoxynous) any mind” – What’s to say? Epoxynous is an individual who co-manages a website in the States, JazzRoc is a retired Welsh gentleman in Tenerife. “He’s been around a long time” – Yes. I am SIXTY FIVE years old, bass-guitarist, pianist, jet-engine tester, designer, COMPOSER. I, like Orwell, believe that in a time of UNIVERSAL DECEIT the TRUTH is a REVOLUTIONARY ACT (consult my site, also MySpace). “sole purpose/deceive/cast doubt/not yet woken up” – A TRUTH REVERSAL. “He believes he will not be judged but he will have his part in the lake of fire” – I’m sorry but I am NOT INTERESTED in things that CANNOT be SEEN, HEARD, SMELLED, TASTED, or FELT. Your mind disgusts me. (Another guy who talks past you). “idiots who don’t know/difference/contrail/chemtrail/screw off/Hilton/video” – It’s a FREE world, but if you’d rather bash the Bishop I shan’t stop you. “Don’t bother giving us your textbook explanations” – You? In particular? I’d rather give them to someone rational… it’s the best use for a BOOK. Rick, Harriet, you may think you are caring people, but your activities are contributing to damaging our society from within because the both of you are hopelessly wrong. Clifford Carnicom is an evil person who should be denounced as a Machiavelli, a malingerer, a pseudo-scientist. You are wrong to give such a person support. He is a true terrorist who is preying upon your scientific and factual ignorance. Persistent contrails have been known and photographed for sixty-eight years. Skies first turned white (all over) during the high-altitude close-formation 1000-bomber raids conducted by the USAF Flying Fortresses and Liberators over Germany between 1943 and 1945. 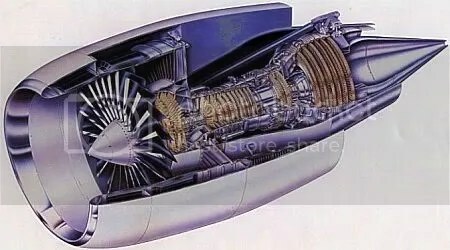 Internal combustion engines, whether they are 2,000 BHP radials or 40,000lb thrust gas turbine fanjets, produce carbon dioxide and steam at 2,000 deg F as exhaust products, with minuscule amounts of soot, and oxides of nitrogen and sulfur. The (invisible!) steam in the exhaust meets stratospheric air at -40 deg F and in a fraction of a second turns to fine ice crystals. Depending on the relative humidity of this stratospheric air, these crystals may (i) sublime to invisible water vapour (ii) persist indefinitely, or (iii) increase in size as they pick up additional water from supersaturated air. From seven miles beneath it isn’t possible to discern the transition from what you would call “normal” air to “stratospheric” air, for, of course, both types of air are normally transparent. Nor is it possible to distinguish easily whether or not aircraft are sharing the same altitude. “Stratum” is the Latin for “layer” and might clue you in to the fact that the stratosphere is layered. These layers normally exhibit differing humidities – they do not mix with each other, nor do they mix with the troposphere – the “normal” air beneath the stratosphere. Hence aircraft flying at various heights through the stratosphere may appear to exhibit all three behaviours I have described – all at the same time. Now I’m no fan of the Patriot act, but it seems to me that “this most evil of assaults” (yours!) falls well within its parameters. I should watch it if I were you. Perhaps you should stop what you are doing and pick up a book on atmospheric science and educate yourself before less sympathetic people undertake THEIR newly-drafted responsibilities to educate you. Those orange suits aren’t fetching and taking their “baths” looks uncomfortable. MY BLOG contains much useful information which may both quell your fears and save the both of you from a lot of trouble. The WHOLE of the atmosphere ALWAYS contains WATER. Whether you’re looking at a cloud or at clear air, there’s actually the SAME AMOUNT OF WATER IN BOTH. The difference in visibility between clouds and sky is simply due to their DIFFERING amounts of heat and water droplet proportions. As far as my eye can see there’s a cloudless sky here, and the rel humidity is 65%. I’m looking at 3,300 tons of invisible WATER in my sky RIGHT NOW.